Frank Schneider and Riley Dolan offer two polar ends of a question that has drawn many theories but few concrete answers: Why don't more millennials vote? YAKIMA — In terms of age, experience and politics, it would be difficult to find two more different people than Frank Schneider and Riley Dolan. 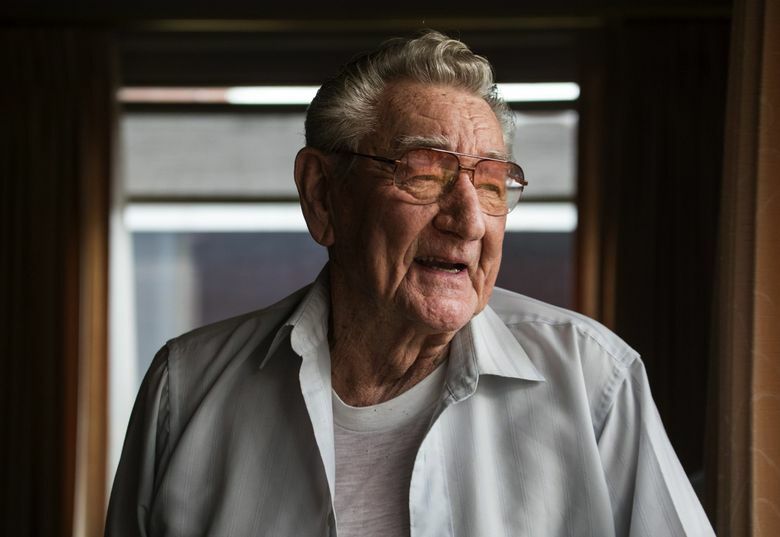 Schneider, who lives in Yakima, is a 90-year-old veteran who voted for President Donald Trump and likes Clint Eastwood movies. 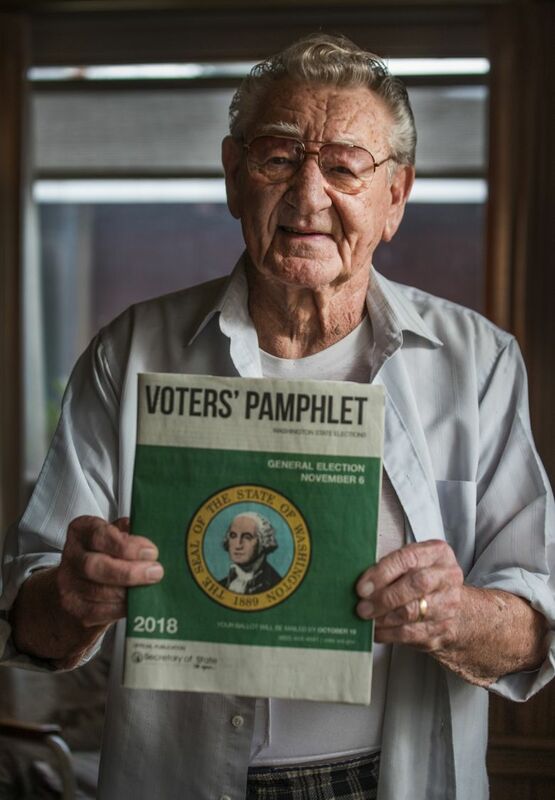 Schneider is proud to say that except for the 2 1/2 years he spent in the Army, he has voted in every election since 1949, when he first became eligible to vote. That means in 67 years, Schneider has voted roughly 200 times, give or take a few. 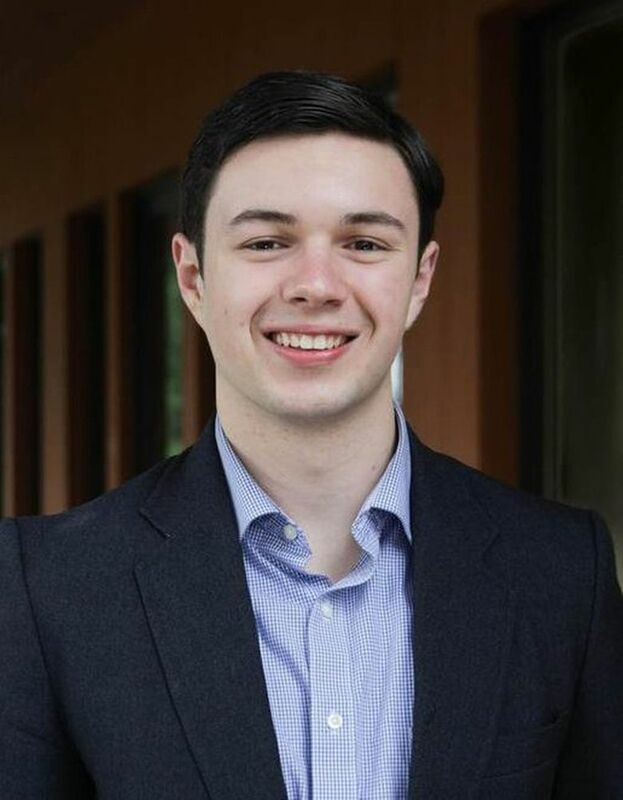 Dolan, 21, is a senior at Pacific Lutheran University in Tacoma, double-majoring in political science and Hispanic studies. He’s also voted in every election since being eligible: three elections. He’s also the student civic-engagement director at PLU, in charge of getting college kids to vote. Dolan says he leans liberal, as do most voters his age, according to Pew Research. Last year, registered voters like Schneider, in the 65-plus age range, voted at three times a higher rate than millennials (61 percent to 19 percent), according to the Washington Secretary of State’s Office. No, says Dolan, it’s not about playing softball. It was different back when he was young, says Schneider. “It just meant a lot to me. This was a big privilege. It made me feel like an adult. I was given responsibility,” he says. 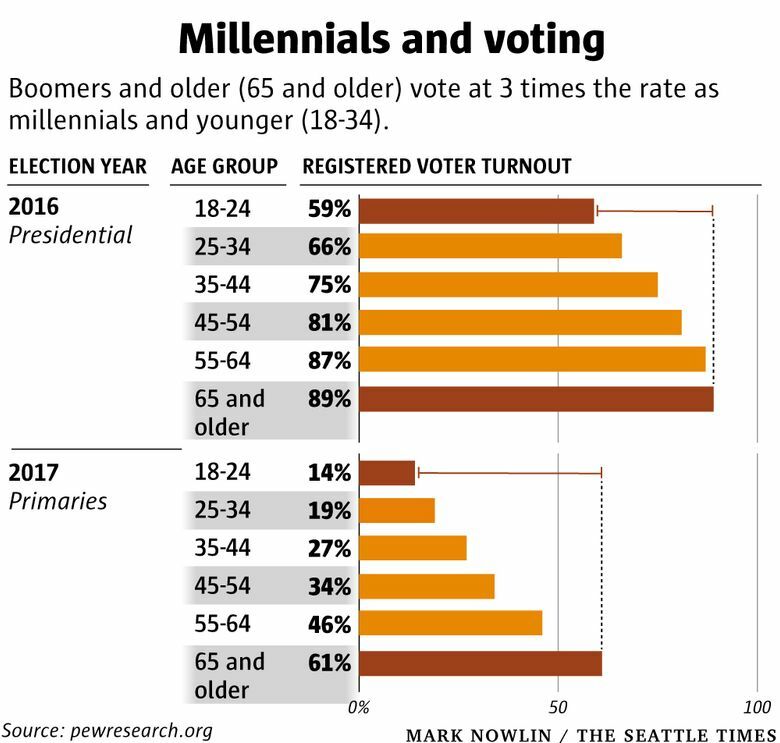 Political experts and candidates have yet to figure out how to get millennials (ages 25-34) and post-millennials (18-24) to vote. 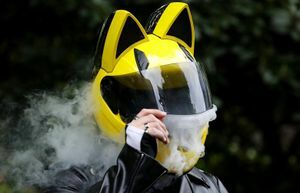 An NBC News/GenForward survey released last summer found that just 55 percent of millennials say they either probably or definitely will vote in November, according to Vox.com. A quarter said they weren’t sure if they’ll go to the polls or not, and 19 percent said they probably or definitely won’t vote. Winograd says, “They clearly know what’s at stake in the country,” well remembering the 2016 presidential election. “They see how their future was impacted,” says Winograd. Of course, he says, there is an expected increase in voting Tuesday across all age groups, so every age group’s share will increase. King County Elections is projecting a massive voter turnout in Tuesday’s midterm election. Dolan believes one thing that prevented millennials from voting in the past was the need to affix a postage stamp to ballots. This year, postage is paid on ballots. “We never go to the post office. We don’t know where to get a stamp. 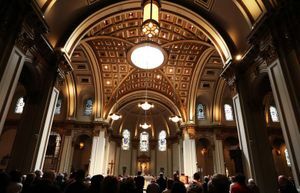 On the rare occasions in which we mail stuff, it’s documents and voting,” says Dolan. 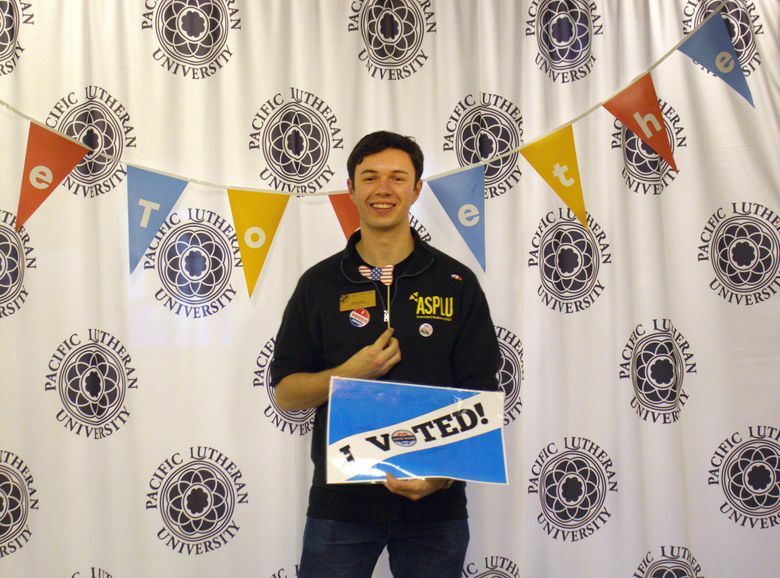 In previous years, at PLU, “We provided free stamps,” he says. Then there are the images of politicians that millennials see. That’d be someone like Chuck Grassley, R-Iowa, 85, who led the Brett Kavanaugh hearing. “I’m saying that it’s very rare to see a young politician who can lead young people to want to vote,” says Dolan. More reasons for millennials not voting? “A lot of people have this viewpoint that it doesn’t matter who you vote for. They think the system is corrupt,” Dolan says. Schneider doesn’t buy it. “If you don’t vote, you’re gonna have dictators,” he says. Schneider doesn’t buy that, either. 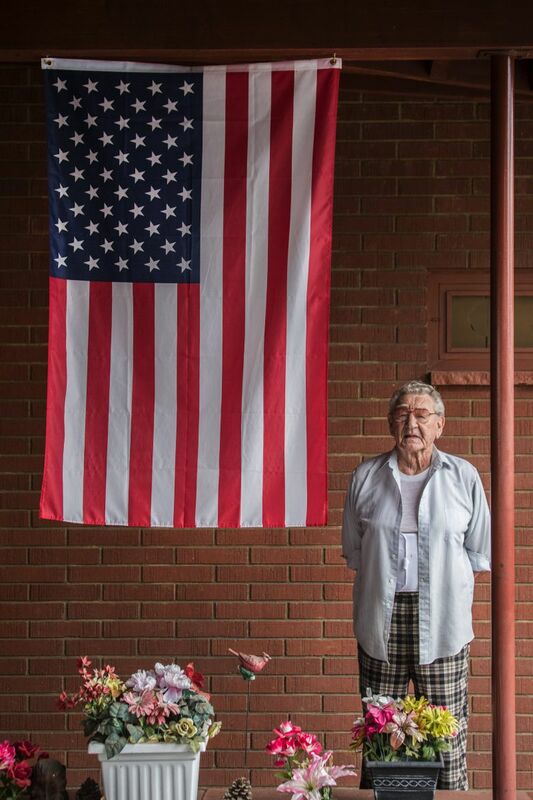 “I squeezed in the time to vote. Ah, boy. Change of address might be a good reason for them not to vote. Guess they don’t think that’s important enough to make a sacrifice,” he says. Dolan says it’s not that millennials don’t care. Dolan says on Thursday there was a ballot drop-off party at PLU, with cookies, hot chocolate, cider and music. There were 35 ballots turned in, admittedly not a lot. But Dolan says it was also a reminder for students that the election deadline was days away. In Yakima, Schneider says he already mailed in ballot No. 201 last Thursday. As their numbers swell to 73 million, by 2019, millennials are expected to overtake boomers in population, says Pew Research. So will millennials decide to really, really engage? “We don’t know yet,” says USC’s Winograd.